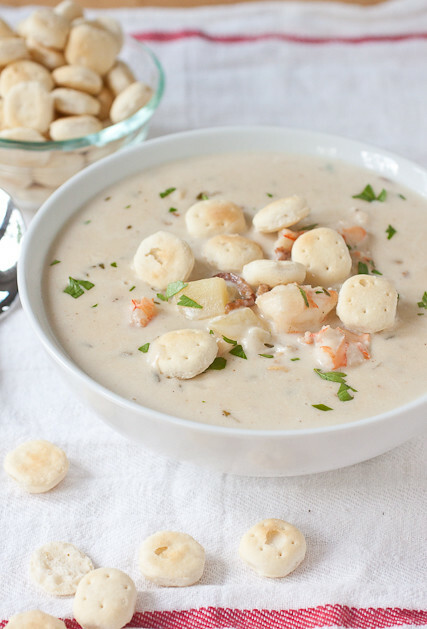 New England seafood chowder: Hearty, creamy, chocked full with lobster, shrimp, scallops, and clams, and made completely from scratch in about 1 hour! This time in September always throws me for a loop. Here in Connecticut, we typically get a few really warm days (80s) and lots of mild days (60s and 70s) that start and end on the chilly side (anywhere from the high 30s to mid 50s). Dressing for this crazy weather is a major PIA and planning a menu is even more difficult. 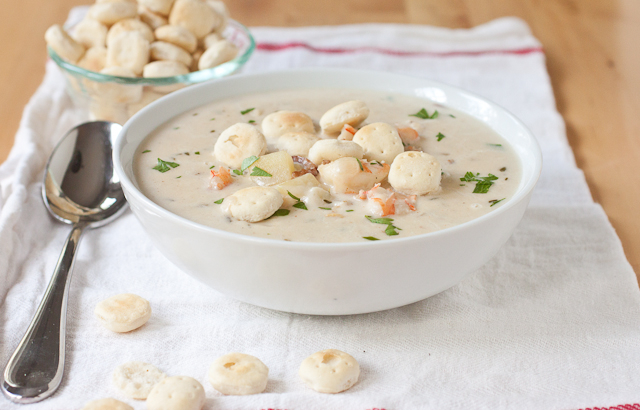 This New England seafood chowder, however, bridges the gap from summer into fall seamlessly. And you would think it would be really easy to find great chowder everywhere here, especially because it’s a coastal state. But really good made-from-scratch chowder is surprisingly hard to find! That’s why I set out to make a killer chowder this past weekend. My mom and I took an afternoon a few weeks ago to make seafood stock from the leftover lobster, clam, and mussel shells from our summer clambake. She froze all of the leftover until we were ready to make the stock so making it was so easy! And I haven’t been able to get this soup out of my brain since we made that stock. In about an hour, two steaming bowls of this soup were on our dinner table. 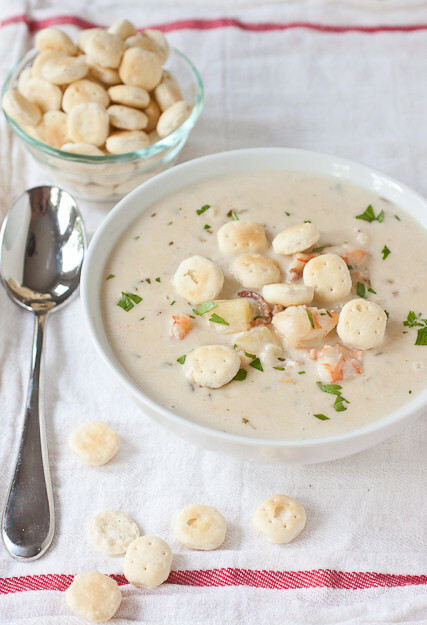 This New England seafood chowder is just the way a really great seafood chowder should be: creamy, rich, but not overly thick, and jam-packed with hunks of seafood. To ease the pain of shucking clams and to reduce the cooking time, I quickly steamed a bunch of little neck clams and two lobster tails, then removed all of the shells. I then chopped the cooked clams and lobster and tossed everything in to the soup at the very end of cooking. Along with the clams and lobster, I also added shrimp, sea scallops, and potatoes. To me, chowder neeeeeds potatoes! And since the soup starts off with some bacon and ends with a splash of sherry, could this New England seafood chowder get any better?? If you’re not into dealing with the fresh clams for this recipe, and you can find fresh frozen clams in their liquid (no shells), this would work fine. Drain the clams and roughly chop them before adding them to the soup with the scallops and shrimp in Step 3. If canned clams are all you can find, this would be ok too. Canned clams is my very last choice of clams for soup but it will work in a pinch. Add 1 inch of water to the bottom of a heavy-bottomed stock pot. Add the clams and lobster tails (if the lobster tails are already cooked, skip this step) to the water. Cover the pot and bring the water to a simmer over medium-high heat. Shake the pot a couple times and after 3 or 4 minutes, check to see if the clams have opened. If most of the clams have opened and a few remain closed, cover the pot and let them cook for another minute. If there are still shells that are completely closed, discard them. Drain the water off, remove the clams and lobster tails, rinse out the pot, and return it to the stove. Remove the clams from their shells by pulling them off the muscle attached to the shell. Remove the outer casings from the clam meat and chop the clams. Remove the lobster meat from the tail shells and roughly chop the meat. Set the clams and lobster aside and discard all of the shells. Meanwhile, set the large stock pot back over medium-high heat and add the bacon. Cook until it is almost crispy and then add the onions; cook until the onions have softened, about 5-7 minutes. Add the thyme and cook for 30 seconds. Whisk in the flour and cook for 1 minute, whisking constantly. Whisk in the warmed seafood stock/water mixture, scraping up any bits on the bottom of the pan. Add the bay leaf and potatoes. Allow the liquid to come to a simmer and thicken, about 5 minutes. Reduce the heat to medium. Add the scallops and shrimp and simmer the soup until the potatoes are fork-tender, about 5 to 7 more minutes. Stir the chopped clams and lobster into the soup. Stir in the cream, sherry, and parsley. Allow the cream to warm through in the soup for a couple of minutes but don’t let the soup boil. Season with salt and pepper to taste – my soup needed 2 teaspoons of salt but yours may be different. Remove the bay leaf and serve hot. Leftovers can be kept refrigerated for up to 3 days or frozen for 2 months. Best kind of fall comfort food ever! I love that you used so much seafood in it, it really sounds wonderful. The thing I miss the most about living in CT is the fresh homemade New England Clam Chowder. Although it may be difficult to find in CT, it is even more difficult to find here in Florida. Thanks for sharing this recipe, I can’t wait to make it soon! I don’t believe I’ve ever had a chowder. Perhaps it’s high time I did. Oh man, you knocked it out of the park with this one – I need to make this.